For at least two years, in malls around Sacramento, a brand new car has been parked next to some long tables with entry blanks. Trendwest, a vacation time-share company offers a new car as the grand prize in their contest as an incentive to fill out and submit a short survey. This helps keep their telemarketers loaded up with new contacts. About 5 months ago I saw that they had posted a simple 8x11 sheet of paper with a winner. "I can do better than that", I thought. 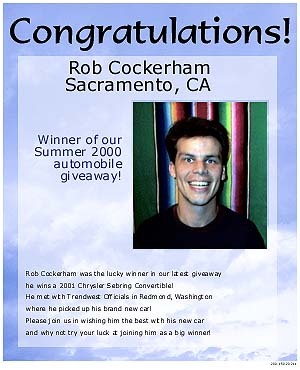 Rob Cockerham was the lucky winner in our latest giveaway he wins a 2001 Chrysler Sebring Convertible! He met with Trendwest Officials in Redmond, Washington where he picked up his brand new car! Please join us in wishing him the best with his new car and why not try your luck at joining him as a big winner! 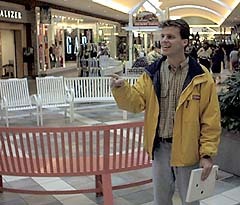 I went down to Sunrise Mall in Sacramento first. I thought they had a give-away there. You can see the nice plastic box-frame I prepared for the print-out. Walter and I wandered around the mall on Wednesday before Thanksgiving. We couldn't find the car give-away I was about to win. 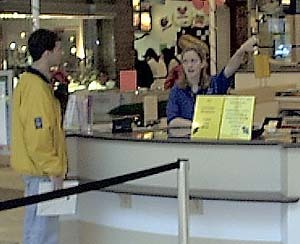 To make absolutely sure, I asked Mall Information. There was no car here. After work I drove out to the new Roseville mall, but to my dismay, there was no car giveaway there either! 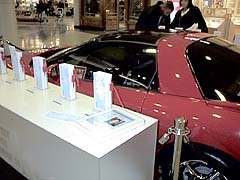 Finally I went to Arden Fair Mall, where I knew a car was on display. I just placed the picture box on the counter next to this Firebird. From there I went to Downtown plaza, home of the infamous Terrace Cafe prank. 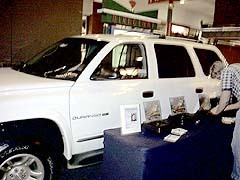 I stood the plastic frame up on the left end of the table, in front of this Ford Expedition. Hopefully these two fake signs will stay up through the holiday weekend & all of my old friends from high school will see it. What the hell is a Sebring? There really is a Chrysler Sebring. It is a luxury car. It gets it's name from the Sebring International Raceway in Florida, home of the 12 hours at Sebring race. 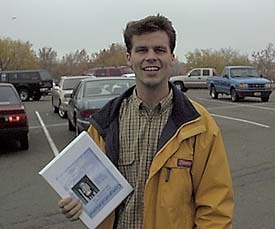 The 2000 Sebring Convertible is a 2-door, 4-passenger compact sport convertible available in two trims, the JX and JXi. The Sebring Convertible's closest competitors include the Mazda Miata, Ford Mustang, Chevrolet Camaro and Volkswagen Cabrio. According to Chrysler, the Sebring Convertible "delivers an unprecedented combination of style, room and quality that delights convertible buyers and provides coupe buyers with an appealing alternative.